Let us begin by saying that keychains, koozies, pens and t-shirts aren’t going anywhere. There has and always will be a need for these traditional promotional products. And while these products are classics, recently it has become apparent that there is a new wave in promotions moving away from the usual suspects. We’re seeing a trend of buyers putting an emphasis on quality and trendiness over price. Some have accused our industry of pushing cheap trinkets and “chotskies”, and in response the industry has looked to the retail sector for a bit of inspiration. We are always trying to push the envelope in providing new and innovative products, and the industry is slowly following. Retail brands influencing our industry in two key ways. First, the emergence of brand name ‘look-a-like’ products, and secondly; an increase in retail brands entering the promotional product sphere. There will always be a portion of buyers who are willing to spend considerably more for brand-name products. But for a majority of us, retail copycats are a great option for our needs. For a fraction of the price you are getting a customized, sleek, retail-looking product. In addition, you are also able to decorate the product with your logo, which isn’t always possible with some of the high-end brands. A great example of a vendor copycat is with the trendy S’well look-a-likes that have emerged in the wake of the designs popularity. While S’well bottles can cost as much as $60, a buyer can get an almost identical product for $15-$30. And that includes their logo! 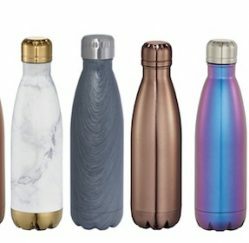 These bottles are sleek and come in a variety of colours and patterns. Looks aside, they are also comparable in quality and can keep beverages cold for up to 24 hours! Drinkware isn’t the only category taking cues from the retail sector. We are seeing this trend in almost every section of the business. 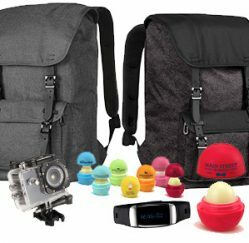 EOS lipbalm look-a-likes are available for half the price, and promo fitness bands have emerged to compete with FitBit at a much lower price point. 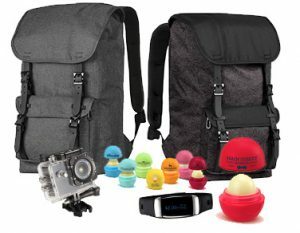 There are cameras that are just as good as Go-Pro and bags that are definitely “inspired by” Herschel. These products look and feel like their retail counterparts, but are still budget-friendly for clients. When one vendor comes out with a copycat product, other promotional product suppliers end up following suit in order to compete. No matter what product you are looking for, there is bound to be an option for any budget. Another trend we are seeing is the emergence of retail brands entering the promotional product space. Companies that have traditionally sold their products in retail stores are now partnering with promo product vendors in order to expand their reach and offer customized solutions. For marketers it truly is a struggle to make a connection between a brand and the consumer. While brand recall continues to be a challenge for advertisers, promotional products average an 88% recall rate with consumers. These recall rates apply to average promo products: t-shirts, totes, pens, etc. If a basic product is generating these results, think about how much more effective these rates are on a high quality, retail-looking product? If a buyer is keeping their branded koozie for an average of 8 months, imagine how long they would keep a Sony speaker, a Fossil watch or an OGIO golf shirt. These types of items are not often discarded; in fact these high-value products are often integrated into the customer’s everyday life. If you are able to associate your brand with a treasured gift that is used daily by your customer, well, that is what we call Brand Love. As more retail trends permeate our industry we will continue to see new and innovative products. We can say goodbye to “chotskies”, and hello to great products we actually want to use and keep!